Almost exactly a year ago Aung San Suu Kyi was released from a long spell under house arrest - a move welcomed at the time as a sign that the junta was ready for political reform. A spokesman for UN Secretary-General Kofi Annan said he was following the situation closely and with concern - and said developments underlined the urgent need for national reconciliation in Burma. 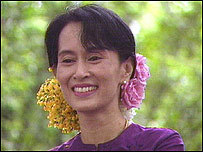 Members of the International Committee of the Red Cross in Burma are reported to be trying to get access to Aung San Suu Kyi. Aung San Suu Kyi has recently attacked the military for the slow pace of change and their apparent reluctance to start political talks, and tensions have been rising between the opposition and the government. Ten members of the pro-democracy movement were sentenced last week to stiff jail terms for organising public protests and being involved in clandestine activities. Aung San Suu Kyi's National League for Democracy won elections in 1990 by a landslide, but the military regime which has run the country since 1962 refused to hand over power. She has spent much of the last decade under house arrest, but her popularity among the Burmese has not waned. Aung San Suu Kyi had been making a political tour of the north of the country when violence broke out in the in the town of Yaway Oo, about 560 km (400 miles) from Rangoon. The BBC's Burma analyst Larry Jagan says the government has been irritated by the amount of support she continues to receive when she leaves the city. He says that on recent trips the government has harassed and intimidated the large numbers of party supporters who tried to come and meet her, and a number of clashes have broken out. After a seven month interlude, the military junta had hinted this month it wanted to meet Aung San Suu Kyi again, raising expectations that the dialogue process between the two sides could be resumed. "The military says she's being held for her own protection"